"I appreciate Teresa Seloske for wiping down every library book with an anti-bacterial wipe when it comes back to help keep our children healthy." We endeavor to make our reading atmosphere as comfortable as possible. These 7th & 8th graders are reading with a virtual fireplace on the classroom monitor. Reading is the key to academic success. Besides regular classroom reading assignments, grades one through eight all participate in the Accelerated Reading program. 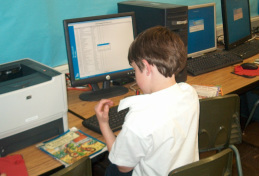 Students take a computerized test to determine their reading level and are assigned a quarterly reading goal. Our library & classroom books are marked and color coded so students are able to quickly find & check out books within their reading level. Once a student reads a book, they take a computerized test to measure comprehension. The student/computer ratio is 2:1 with computers located in the classrooms, rather than in a computer lab, so tests are easily taken. If a student finds a book they'd like to read outside of our computerized Accelerated Reading program, he or she may write a book report and still earn Accelerated Reading points. Since Accelerated Reading was implemented more than a decade ago, library book check-outs have skyrocketed, parent concerns about their child being able to read their library books have plummeted and reading scores have soared. 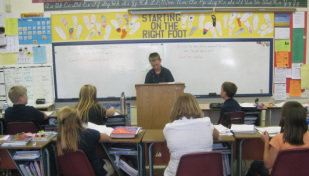 Students are given many opportunities to read and speak aloud. Classroom presentations are regularly required. Beginning in the first grade, students announce songs and read petitions, responsorial psalmns and the Bible readings over a microphone during Mass. By their 8th grade graduation, they are experienced public speakers. If a child is having difficulty with either reading or math, we offer reading help within our school through the Title I federally funded program.